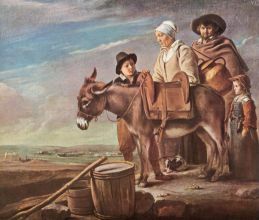 The three Le Nain brothers were painters in 17th-century France: Antoine Le Nain (c.1599-1648), Louis Le Nain (c.1593-1648), and Mathieu Le Nain (1607-1677). 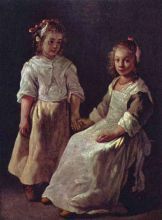 The three were born in Laon (Mathieu in 1607; Antoine and Louis were originally believed to have been born in 1588 and 1593, respectively, but those dates have since been disputed: they may have instead been born just before and just after 1600), and by 1630, all three lived in Paris. 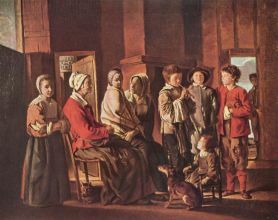 Because of the remarkable similarity of their styles of painting and the difficulty of distinguishing works by each brother (they signed their paintings only with their surname, and many may have been collaborations), they are commonly referred to as a single entity, Le Nain. 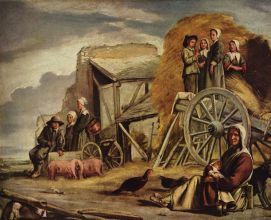 Louis is usually credited with the best-known of their paintings, a series of scenes depicting peasant life. These genre paintings are often noted for being remarkably literal, yet sympathetic; the subjects are never grotesque or seem ridiculed. 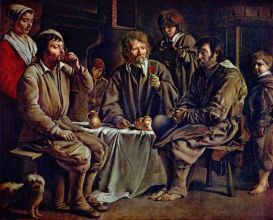 There remains some question, however, as to whether some of the assumed "peasants" were truly from the rural class--many seem to be simply the bourgeois at leisure in the country. The brothers also produced miniatures (mainly attributed to Antoine) and portraits (attributed to Mathieu). Mathieu became the official painter of Paris in 1633, and was made a chevalier. 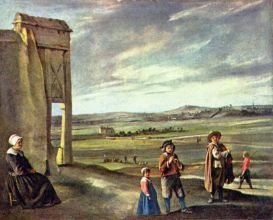 The Le Nain paintings had a revival in the 1840s and, thanks to the exertions of Champfleury, made their appearance on the walls of the Louvre in 1848. Champfleury was a friend of Realist painter Gustave Courbet, a theorist of Realism and writer on French popular arts. 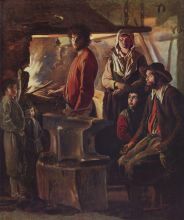 The 'naive' quality of these works, with their static poses,'awkward' compositions and peasant subjects were admired and may well have exercised some influence on many nineteenth-century artists, notably Courbet himself.